A school district in New Jersey has been under a lot of fire due to asbestos being in their vicinity. The Pinelands Regional School District may be facing a $7,000 fine from the Office of Public Employees’ Occupational Safety and Health. This hefty fine is due to the school failing to provide asbestos training to their janitors. However, parents are now beginning to become more concerned about the safety of their children. Asbestos exposure started becoming a concern when air quality issues arose. This was brought to limelight after the school had their roof replaced. During the roof construction, asbestos-containing materials were discovered. Out of 18 samples that were taken for air quality tests, one asbestos fiber had been detected. “The roofing project is an ongoing process. Due to the dust and debris related to the construction, it was necessary to relocate classrooms, which raised general levels of concerns,” Stevenson stated. Currently, the students are attending classes at the school district’s junior high school. Not only are these children having to deal with a new schedule, but they, unfortunately, have to make up 5 missed days due to the closing of their high school. Check out this video of one of the meetings that the school officials hosted to update the parents about the school’s construction. So, How Old Is This School Building? The Pinelands Regional High School officially opened its doors to faculty and students on September 5, 1979. Up until current events, this facility was a public school that taught grades 10th through 12th. This school building has been around for about 38 years. Since it was built, a lot of changes have occurred in building construction. School buildings and homes built prior to 1980 main still contain asbestos in them. Asbestos was used frequently in construction because it is strong, durable, heat resistible, and it doesn’t corrode. This was the case for Pinelands Regional High School. When they removed the school’s roofing, asbestos was discovered. To get an idea of how big this roofing project was, check out this video. Apparently, a letter was sent to school officials in September to notify them about asbestos debris and the harms it could potentially cause. On contrary, Interim Superintendent Maryann Banks said she wasn’t aware of this letter until it was too late. “Had I known about that when I should have, I would have closed down the building,” Banks stated. However, the school remained open until a roof screw fell on a student. This has left many parents both angered and concerned about the health and well-being of their children. “Why were our children and staff and administration put in harm’s way?” One parent said. Honestly, we are all curious about the answer to this question. The latest air quality report on the school’s website states that there are no levels of asbestos in the school building. However, a test that was conducted on the school’s playground states something different. The company TTI Environmental, Inc. discovered that there is 5% of chrysotile debris in the school’s wood chips. Chrysotile is one of the most commonly used forms of asbestos. The company recommends that the school properly removes these wood chips and replaces them with new ones. You can read more about the report here. Asbestos is the only known cause of mesothelioma. This carcinogen is also capable of causing other asbestos-related illnesses, such as asbestosis. Fact: there is no safe level of asbestos exposure. In occupations, employees have a right to know about harmful chemicals in their workplace. Do you think that this law should apply to anyone that may be at risk for exposure? Pinelands Regional Parents Angry That High School Stayed Open. patch.com. Retrieved from: https://patch.com/new-jersey/barnegat-manahawkin/pinelands-regional-parents-angry-high-school-stayed-open. Accessed: 11/03/2017. Asbestos contamination closes Pinelands Regional this week. pressofatlanticcity.com. 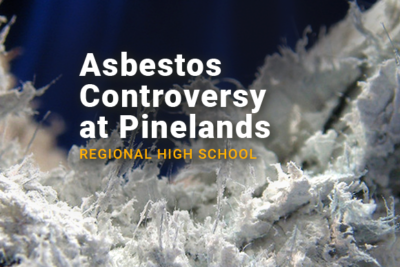 Retrieved from: http://www.pressofatlanticcity.com/education/asbestos-contamination-closes-pinelands-regional-this-week/article_30cf24ed-20c6-5bd9-89b7-130e07112cc1.html. Accessed: 11/03/2017. TTI Environmental, INC. wixstatic.com. Retrieved from: http://docs.wixstatic.com/ugd/f5b8e8_467665f2c3f04c66bbaa230480777fd3.pdf. Accessed: 11/03/2017. Health and Safety. pinelandsregional.org. Retrieved from: http://www.pinelandsregional.org/health-and-safety. Accessed: 11/03/2017. Where Is Asbestos In The Home?. healthybuildingscience.com. Retrieved from: http://healthybuildingscience.com/2014/10/10/asbestos-in-the-home/. Accessed: 11/03/2017. Welcome to TTI Environmental, Inc. ttienvinc.com. Retrieved from: https://ttienvinc.com/. The History of SRHS. srsd.net. Retrieved from: https://www.srsd.net/aboutus/brfhis.aspx. Accessed: 11/03/2017.